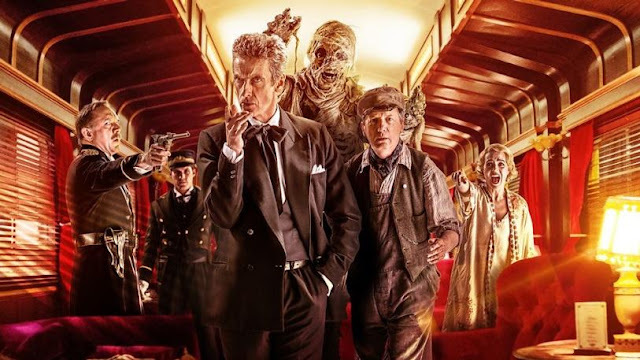 Doctor Who: Series 8 With Hindsight - MUMMY ON THE ORIENT EXPRESS | Warped Factor - Words in the Key of Geek. Tony Fyler wants his mummy. The idea of Agatha Christie in Space is hardly a new one in Doctor Who – a confined environment with people dying one by one is basically the precursor of the base under siege story. On broadcast though, Mummy On The Orient Express felt both original and thrilling, despite a Doctor more alien than at any time so far in the Twelfth Doctor’s life, burning through people’s lives and deaths in an effort to solve the mystery of the Foretold. A year on, does Jamie Mathieson’s Mummy still hold us in its grip? Short answer: yes – moreso if possible. The pre-credits sequence effectively shows the dilemma at the heart of the episode’s terror – you have a last 66 seconds to live, and you know it, can see your death reaching out towards you like a decrepit Egyptian mummy. No-one else can see it, you can’t harm it, and you can’t run away because it turns up behind you and it just keeps coming. The mummy itself is properly creepy, teeth from a dead skull showing through bandages as it drags its way endlessly around, one foot lagging painfully, its accusing finger pointing out each victim before it begins its 66-second advance. The timer, which helpfully, creepily, shows up on screen during every mummy-kill is a potent storytelling device – we count down each victim’s life like it’s a game, like a ‘coming, ready or not’ game of hide and seek, forcing us inadvertently onto the side of the monster. After the credits, we spend a little time with Clara and the Doctor, and there’s a heavy sad dynamic – the last thing we knew, Clara was angrily telling the Doctor to go a long way away, and here it feels as though in the wake of Kill The Moon Clara has grown-up beyond the Doctor’s reach. This trip on the Orient Express in space is their last hurrah. The sense is of Tegan telling the Fifth Doctor it’s stopped being fun and running away from her life on the Tardis. The style though is space-based faux-nostalgia, like the recreation of the Titanic in Voyage of the Damned. Here we’re on the product of a night of greasy-pistoned pleasure between the Orient Express and the Starlight Express, a decadent wood-panelled train soaring along on hyperspace tracks, with a chanteuse singing Don’t Stop Me Now and people making sparkling small talk. The dynamic between the Doctor and Clara is particularly poignant as she tells him how she doesn’t hate him, and he’s just bursting to talk about the planets. It’s an exquisitely uncomfortable moment, reminiscent of parents trying to tell children about the facts of life and the kids wanting to go and play, or conversely, of the chronic embarrassment adults sometimes feel when their child starts asking adult questions. Either way, it’s a moment of beauty before the investigating begins. Another moment of beauty? The Doctor arguing with himself and a Tom Baker voice roaring to the front, as though this Twelfth Doctor is really just a mask for all the other quarreling versions of himself that are just beneath the surface. 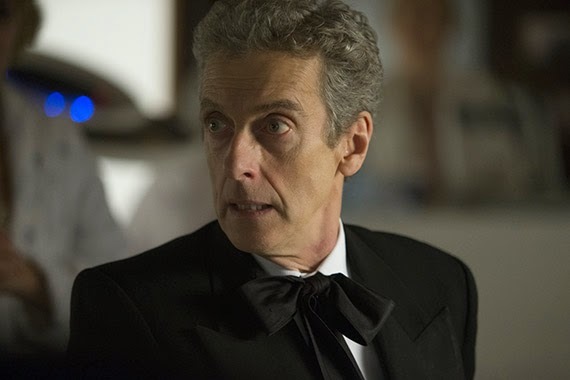 Another – Peter Capaldi in his more Pertweean evening wear. Another – a cigarette case full of Jelly Babies. Another – the Doctor as a Mystery Shopper. Another – Frank Skinner’s performance as Perkins. Another – the life-sustaining capsule shaped more than a little like Sutekh’s sarcophagus and the glowing lights from inside it (Mathieson, you tease!). Jamie Mathieson’s first televised Who script is positively studded with these gems like a Christmas pudding’s studded with fruit, and even were the central mystery not sufficient to keep us glued to the screen, there are enough of them to keep us hanging on for the next one, and the next, and the next. But happily, he marries all these glorious moments to a central dilemma that takes what could easily have been a stunt-title (Journey To The Centre of The Tardis, Vincent and the Doctor, Dinosaurs On A Spaceship, etc) and turns it into the stuff of Who legend: the Foretold, an ancient mummy mystery in space, the train being a trap, a lure for experts to not only solve the mystery but help to reverse engineer the mummy’s capabilities, the nature of what the mummy actually is and why it does what it does unfolding as death follows death follows death like a classic Christie novel, each death giving us more clues or more scope for surmise. Mathieson’s mummy, by the end of it all, feels like it can hold its bandaged head up high alongside some of the more well-remembered one-shot monsters from the Classic era. The point about that is it’s such an enormous relief – when you watch Mummy On The Orient Express you suddenly realise it’s the first time in the Capaldi era that you’ve really been able to say ‘here’s a monster that can stand with the Classics.’ In Perkins, Mathieson also gives us the first person that the Twelfth Doctor seems to actually respect and like (Sure, Courtney Woods, to some extent, but Perkins brings a much more fully-formed and adult appreciation from the Doctor). And that’s an enormous relief too. You don’t realise what you’re missing until it’s right there in front of you, and what Mathieson and Director Paul Wilmshurst bring us in Mummy On The Orient Express is a sense of Classic Who, with the trappings and the budget and the pacing of New Who, down to the very last second. The Doctor, as we say, is at his harshest and most alien here – ‘No of course I can’t cure her, why would you think that?’ He actually gets Clara to lie to a relatively nice if shallow young woman who’s going to die, so that he and his fellow boffins can watch her terror as death catches up with her. It’s hard for even those who wanted a harder, more alien Doctor to watch and it’s why at the end, Clara desperately needs to believe that he was just pretending to be heartless, to keep his plan from Gus, the psychotic who’s trapped them on the train in the first place. ‘Would you like to believe that about me?’ the Doctor asks her. ‘Would that make it easier?’ But he gives her the uncomfortable truth because she’s deserved it and because for all he knows they’ll never see each other again. ‘I didn’t know if I could save her. And if it had killed her I would have just gone on to the next, and the next. Until I beat it.’ That’s the fundamental Doctor – his need to beat the bad things in the universe leading him, sometimes, to some dangerous conclusions. But at the very end, Clara can’t let go of it just yet, the wonder of the universe and of being extraordinary. And so, after having reached a place of honesty where her boyfriend knows about her alien friend, it’s Clara here who deliberately reaches a compromise that lets her be both things to both people – she lies, telling the Doctor that Danny’s fine with them continuing to see the universe. It’s essentially a re-set of the secrecy from the pre-Caretaker days, as she goes back to hiding her adventures with the Doctor from Danny, and hiding Danny’s probabl displeasure about them from the Doctor. 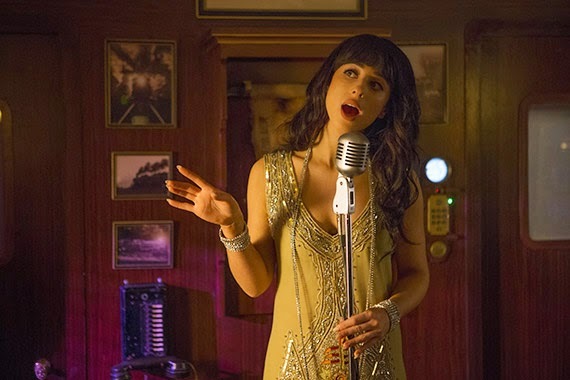 If anything, this shows us the unreasonableness of men who try to put limits on the potential of the women in their lives (it’s another reason we as an audience find it hard to warm to Danny – he’s the Mickey Smith or the Rory Williams who couldn’t grow to let his lover be all she could be). The story of the Foretold is the first time in the Capaldi Doctor’s tenure where everything seems to click, and it shows a potential that fans had been worried was gone forever, which is why Mathieson was highly lauded at the time as a fan-favourite to take over the job of showrunner from Steven Moffat, some fans almost insisting the change should be made immediately. In essence, Mummy On The Orient Express gave a taste of what the Twelfth Doctor’s stories could be like. So far, it seems to have become a lodestone for the storytelling in Series 9, which is why so many Classic era fans are pricking up their ears and feeling much more comfortable with the Twelfth Doctor this year. Watched with a year of hindsight, Mummy On The Orient Express feels just as strong as it did on broadcast, if not moreso, and highlights its status as a serious high point of Series 8 by making you realise quite how much better it is than some of the stories that preceded it. Give Mummy another play today, and remember where the origins of Series 9’s style were born.